I boarded a plan to Littleton, CO just two days after 17 people were killed and many others wounded at Marjory Stoneham Douglas High School in Parkland, Florida, when former student Nikolas Cruz opened up his semi-automatic assault AR-15. I was going to Littleton to celebrate the wedding of my niece. 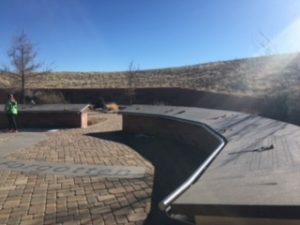 On Saturday afternoon I took a drive around Littleton and began to notice buildings and housing developments with the word “Columbine” in them: Columbine Heights, Columbine Rd, Columbine Church of Christ and so on. 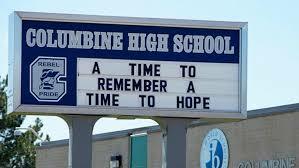 I began to wonder: is there were Columbine High School is located too? 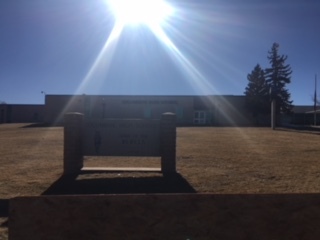 A quick Google search confirmed that this indeed was the home of Columbine High School, where on April 20, 1999, 13 people – 12 students and one teacher – were killed by two students in masks, the same Columbine that raised our national awareness on gun violence and issued us into the era of mass school shootings. According to one source, there have been 208 school shootings since that tragic April day – Parkland being the latest. These days Columbine High School looks like a fairly normal suburban high school surrounding by athletic fields and a city park. On the day I visited there was a youth basketball event going on, so the parking lot was full. I parked my car and started walking around the outside of the school. About a quarter mile behind the school I saw a sign indicating there was a memorial to those who lost their lives. So I took a path up the hill. The monument consists of two semi-circles. The inner circle contains a memorial to each of the dead with words about the person by surviving loved ones. The outer circle contains words from survivors. Even though this monument had been erected nearly 19 years ago, it was well maintained, and fresh flowers had placed by the names of the deceased. There were about 10 people when I arrived, including two young people who appeared to be brother and sister maybe 14 or 15 years old. Everyone was quiet and the mood was solemn. Two hundred and seven shootings later, not to mention other countless deaths in movie theaters, Las Vegas malls, shopping centers and other public spaces, it appears that our national intransigence and addiction to guns must lead us to admit that we have learned very little. On April 20 this year students of Parkland and around the country are calling for a national school walkout and march on Washington to demand changes on current gun laws. Hopefully, this can be a start for a concerted effort to challenge and change the way guns are sold and registered in this country. However, because gun laws are largely regulated at the state level, true change will require similar actions in states across the country. When #45 spoke up in response to the tragedy in Parkland, he talked about providing more help for those who struggle with mental illness, but when asked about gun laws, he remained silent. The true mental health issue here is the delusional thinking of gun rights advocates under the leadership fo the NRA, and the continued denial of the need for this country to pass sensible gun legislation that limits the availability of not only high powered weapons such as was used in Parkland and Las Vegas, but of handguns legally purchased thru straw purchasers who then spread illegal guns throughout our communities. The true mental illness is the tired excuses given by legislators (whose coffers are well financed by the NRA) why common sense laws cannot be enacted. 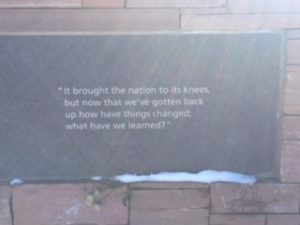 My trip to Columbine High School and its memorial was a sobering and sad moment. I have little faith in legislators pulling their heads out of the sand, but I do have hope that thru consistent action, we can begin to move away from the insanity that afflicted both Columbine and Parkland and all the victims and their loved ones in between. Drick, your comments represent nothing but tired, old leftists reterect. Blame the guns and blame the NRA. Boring!! All your words and nothing about the failure of law enforcement to stop this evil kid when they were warned. Warned more than once. Waiting for the day when you rail against the horrible loss of life due to abortion. Drick, I challenge you to be as hard on Planned Parenthood as you are on the NRA…. Need some help? Go Google Mother Teresa’s comments on abortion. You are correct in that I am tired because I have been writing about gun violence prevention for 10 years or more. I had to preach as a guest speaker the Sunday after Columbine. I have been talking about this for a long time. Yes there were failures of law enforcement, and yes mental illness is an issue, these things are not in question. But denying the role of guns in this issue and the fact that this young man could legally purchase an AR-15 are old issues too that no one wants to address. We are the only developed country with regular shootings in schools and public places by people who legally purchased guns. I will never accept that, no matter how “tired” I get in repeating it. Your not tired, your comments are. You want to do something, then work to repeal the 2nd amendment. Go for it. You make the assumption that all I do is talk and you assume I am against the 2nd Amendment. But here is how it actually is. I actually not interested in repealing the 2nd Amendment. That is a common stereotype of people like myself who want “common sense” laws. Instead here is what I have worked on ( with others) in the last 10+ years. – Repealing the Tiahart Amendment which prevents ordinary citizens from accessing information on which gun shops are the source of the most illegal guns secured through straw purchasing. – Requiring more extensive background checks that allow for thorough checking of crime and mental health records. Let someone wait 10 days before getting their gun while their given a thorough background check. So I have not just been talking in (to use your language) in tired liberal rhetoric. These are all concrete proposals that do not restrict the right to own a gun, limit hunters, collectors or target shooters. But they do take seriously the responsibility for those who own a gun. And all of these common-sense proposals are opposed by the NRA who is one of the leading funders of Republican election coffers. So yes I am tired of delusional thinking and pro-gun trying to take guns out of the equation when talking about the causes of events like Columbine and Parkland. So my question is what is your responsibilty? What have you done? Just today there was lockdown in Orono (Minnesota) high school near where you live and where my niece goes to school. What is your response? It is very ironic, because Columbine-which occurred about 20 years ago-was supposed to have changed things in terms of police response. Prior to Columbine (and during Columbine), police waited before entering an active shooter situation. After Columbine , that all changed, and the idea was to engage an active shooter. The article I just linked is somewhat ironic, because it was written shortly after Parkland and it assumes the post-Columbine protocol was followed at Parkland. But apparently the first responders (Peterson and the other three) followed the pre-Columbine approach. Absolutely hilarious &just goes to show you how ridiculous gun control death numbers really are! Besides the majority of these shootings since Columbine are created events by the globalist’s to disarm American citizens so they can implement their NWO agenda. Anyone who thinks otherwise is deluding themselves to the truth.